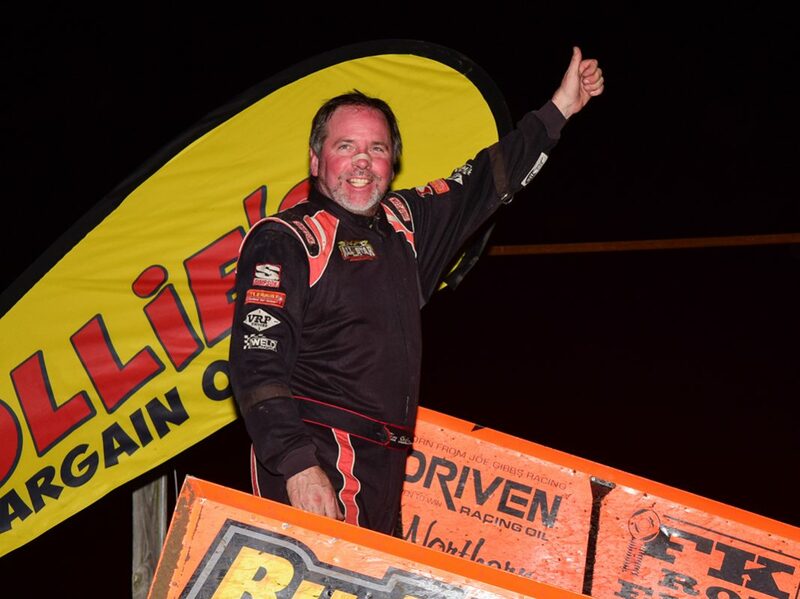 OCALA, Fla. – Night two of the Bubba’s Raceway Park Winter Nationals ended just like night one, with a beaming Tim Shaffer in victory lane. 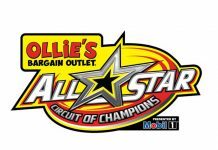 Shaffer’s second Ollie’s Bargain Outlet All Star Circuit of Champions score of the year came at the expense of fast-timer and dash winner Jacob Allen, who got snookered in traffic but was otherwise fast enough to win. Corey Eliason, who started on the pole with Allen alongside, was third ahead of Mark Smith and Chad Kemenah. With a light drizzle falling as the green was thrown, Allen shot away from the field and was lapping by his fourth tour of the odd-shaped three-eighths-mile oval. 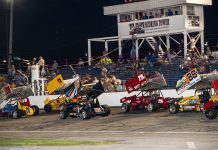 With traffic slowing his pace slightly, the leader soon had the third-starting Shaffer and Eliason on his back bumper doing everything possible to take command. A yellow on lap five for a slowing Jim Shuster got Allen out of traffic momentarily but four laps after the green reappeared, the lead trio was again knee deep in lapped cars. Five laps later, Shaffer found his opportunity and took it. Tough indeed. When a lapped car slowed the leader’s progress off turn four two laps before halfway, Shaffer dove for the bottom and hit turn one with a lead he would easily hold to the end. Eliason did manage to excite the crowd when he get alongside Allen with two to go but the Californian couldn’t quite put him away. Lucas Wolfe led the second five, which included Allen’s teammate Logan Schuchart, Aaron Reutzal, Carson Short and Carson Macedo. Sheldon Haudenschild won the B-Main. 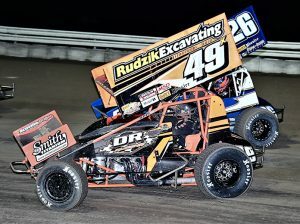 Tim Shaffer, Jacob Allen, Cory Eliason, Mark Smith, Chad Kemenah, Lucas Wolfe, Logan Schuchart, Aaron Reutzel, Carson Short, Carson Macedo, Brock Zearfoss, Shane Golobic, Tony Stewart, Paul McMahan, Shane Stewart, Sheldon Haudenschild, Danny Dietrich, Josh Baughman, Cale Conley, John Garvin, Bradley Howard, Anthony Fiore, Danny Smith, Jim Shuster.